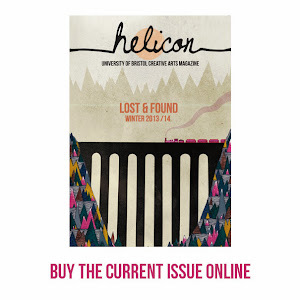 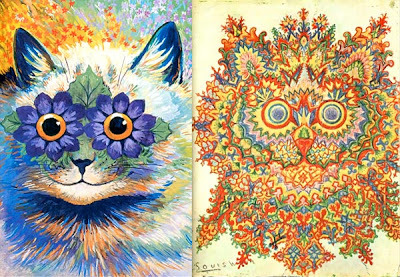 Helicon Magazine: Louis Wain: the effects of schizophrenia on the perception of the artist. Louis Wain: the effects of schizophrenia on the perception of the artist. 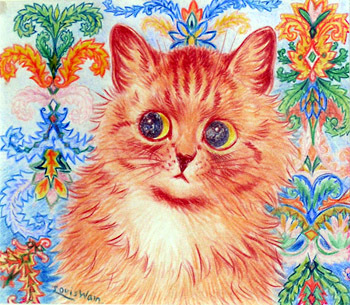 Louis Wain (1860 – 1939) was a Victorian English artist best known for his drawings, which often feature anthropomorphised wide-eyed cats and kittens, and use bright colours. Although this point has been contested, some psychologists argue that Wain suffered from schizophrenia in his later years, and that this degeneration can be seen in his works. Whatever the psychological background, by contrasting Wain's earlier and later works one witnesses a drastic alteration, a dramatic transgression from conventional, naturalistic, realistic paintings using sedate, true-to-life colours, to vibrant, psychedelically-hued cats with disturbingly large, human-like eyes, painted in increasingly erratic brushstrokes. 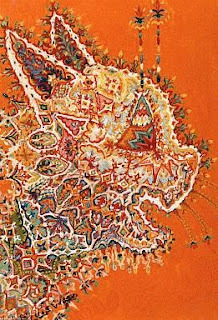 Wain's entire painting style seems to have broken down, becoming far less constrained and perfected, exploding into sporadic, individualistic paintings (which may be more accurately described as patterns, towards the end), which are undoubtedly more expressive and intriguing. 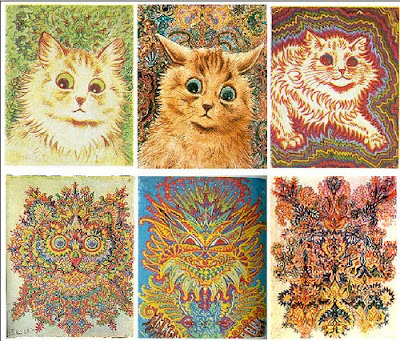 Wain's oeuvre charts the progression of an increasingly distorted perception: the effects of his (apparent) mental illness are as beautiful as they are affecting. 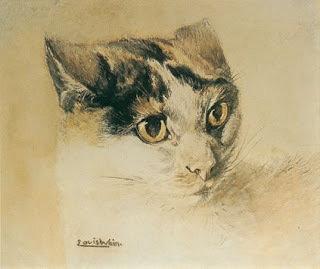 An example of Wain's earliest work.